Rely on Combined Services HVAC for skilled repair and preventative maintenance services across the Chicagoland Area. Make sure your equipment is running efficiently and call Combined Services HVAC today! In the market for a newer, more efficient heating system? Combined Services HVAC provides only the best solutions for you home comfort. Call us today to learn about the heating systems we offer. Getting a new home built, or an addition on your current home? Make sure it is properly insulated with Combined Services HVAC. We offer full HVAC services for new construction. Call us today! Whether you run a restaurant or retail store in the Chicagoland Area, Combined Services HVAC can help you to provide efficient heating and cooling for your customers. Give us a call to get started! With over twenty years of industry experience, Combined Services HVAC provides skilled and affordable residential and commercial temperature control solutions across the Chicagoland Area. Specializing in both new construction and existing homes and commercial facilities, we keep running costs low, while maximizing comfort, convenience, and reliability. Drawing from a wide range options, including Carrier brand heating, cooling, and air quality systems, Combined Services HVAC answers any challenge with modern innovations guaranteed to improve your daily life. The team from Combined Services HVAC is trained and qualified to work on all makes and models of HVAC equipment. Along with installation services, we provide prompt and skilled repair and seasonal maintenance, keeping your essential equipment running efficiently, dependably, and safely. Our commitment to quality extends to the treatment of your property, respect for your time, and quick turnaround on all projects. Call Combined Services HVAC for all your HVAC repairs, maintenance, and installations! We help you enjoy perfect comfort without disruption, worry, or unnecessary expense. 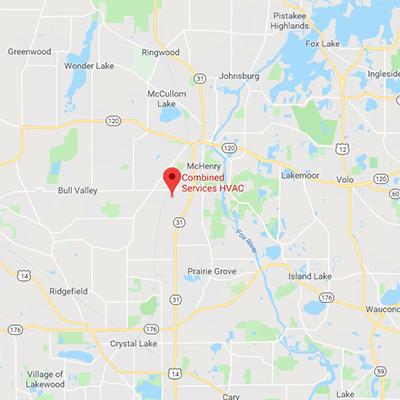 Combined Services HVAC is available to assist you at all hours, 24/7, with Emergency Service throughout McHenry, Crystal Lake, Woodstock & Wauconda, IL. Contact us at 815-322-7016 and speak with a helpful representative of our staff.